The IN A BOX series pairs complementary fiction, nonfiction, and activities, offering young readers different ways to connect to their favorite high-interest topics. Each IN A BOX will contain a photo-driven nonfiction title, an illustrated fiction title, an activity book with stickers, a fan deck of fascinating questions and answers, a poster, and a parent’s guide. All of these formats work together in a fun, interactive, kid-friendly way to build a foundation of knowledge for readers ages five through six. Pairing complementary fiction and nonfiction reading is encouraged by the new Common Core State Standards, as it reinforces information and themes from the reading. The box sets will be equal parts fun and educational. 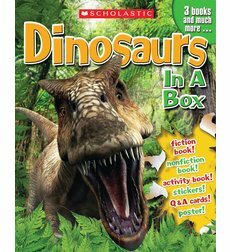 Categories: Activity Books, Dino Books & DVDs, Educational Books, Story Books. Tags: activity book, educational book, fiction book, nonfiction book, poster, Scholastic. Book, stickers.